Many first-timers to Hong Kong may hear the term ‘cha chaan teng’ bandied about, but what exactly is it? 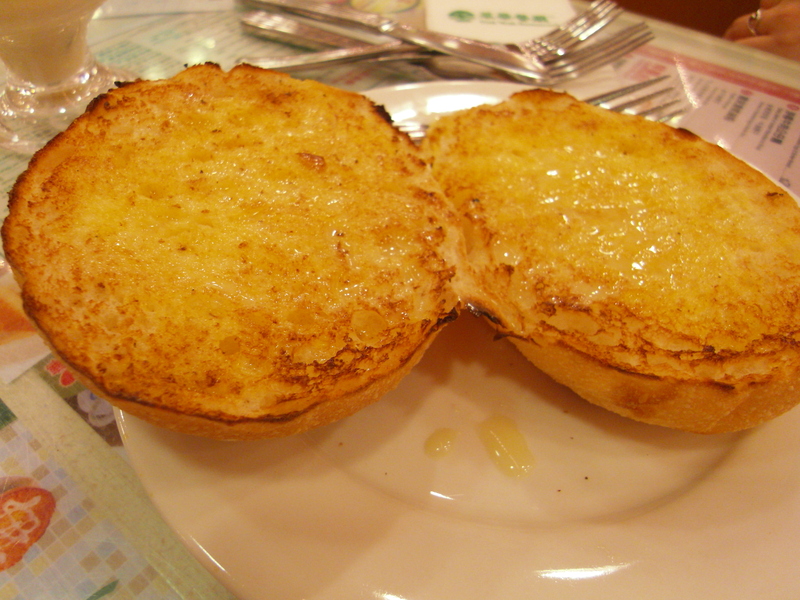 Most commonly found in Hong Kong, though now you can find them in Chinatowns in the UK, Australia and the US, a cha chaan teng is a Chinese tea diner that serves Hong Kong-Western style dishes on the cheap. Well known snacks include wonton noodles, scrambled egg and ham sandwiches, instant noodles with luncheon meat and beef and rice dishes, accompanied by popular drinks such as milk tea, ovaltine and lemon tea. For the uninitiated, cups of black tea are plonked onto your table before you peruse the menu (both Chinese and English you’ll be glad to hear) and then you can flag down a passing waiter, who will take down your order in a blasé manner, seemingly without paying attention. Tsui Wah G/F- 2/F, 15-19 Wellington Street, Central, HK. Tel: 2525 6338. Other branches in Central, Aberdeen, Causeway Bay, Tsim Sha Tsui, Yau Ma Tei. Some of you may be familiar with Tsui Wah, an all time favourite with clubbers who stumble out of bars in LKF and straight into this establishment to slurp bowls of noodles and chow down on toast. This grand institution of cha chaan tengs has several chains dotted around HK and Kowloon and is a go-to for a quick bite. My top picks? Definitely the satay beef instant noodles or the pork luncheon meat with fried egg instant noodles, followed by the absolutely scrumptious ultimate comfort snack, the condensed milk pork chop bun. A very, very generous spread of sweet condensed milk on buttered lightly toasted pork chop bun (without the pork chop). I adore the buttery taste against the sweetness of the condensed milk. Pure decadence. Something even more buttery, sweet, rich and sinful is the peanut butter and condensed milk on toast. The sweet toothed should definitely order this snack. Warning- food coma will strike almost instantaneously. 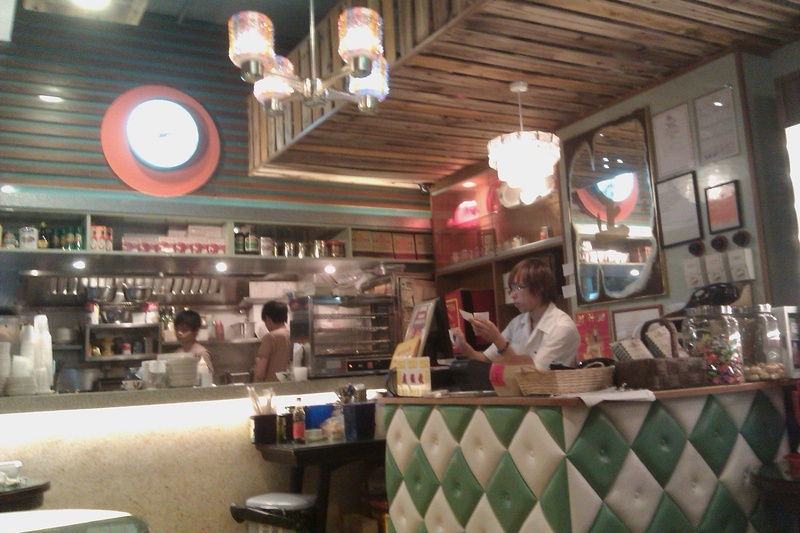 This little gem has decked out its interiors in a Hong Kong ’60s style, with funky green and white tiling on the walls, tacky plastic lights, green blinds and the strains of Canto music of years gone by, playing in the background. I love it. The menu is jam packed with local comfort food, from your baked rice dishes to your soup noodles/ macaroni combo with good ol’ spam or ham with a fried egg. They also churn out some cracking traditional desserts such as egg tarts, mango pudding and cream cakes. The best set meal there is the chicken pie in green pea soup followed by banana hotcakes. The other set offers scrambled egg and ham with a thick piece of buttered toast to start, followed by BBQ pork and peas in a noodle soup. Not as exciting but definitely just as comforting. The green pea soup is an arresting sight as it’s very green. The chicken pie pastry is exactly like the pastry used to make the egg tarts- sweet, light and just the right kind of flaky and the sweetness makes an interesting but moreish contrast against the savoriness of the soup. The best part of the meal is definitely the banana hotcakes. Two gorgeous soft and fluffy hotcakes drenched in syrup and a drizzle of cream, topped with slices of banana and walnuts. This is another small cha chaan teng in Causeway Bay that uses Japanese Hokkaido milk to make its food. There are several sets to choose from including the Breakfast set, the Sandwich set and the popular Hokkaido set which comes with fried eggs and ham on toast, (you can choose how you want your eggs), spaghetti in soup with BBQ pork and a choice of either Hokkaido coffee or tea. 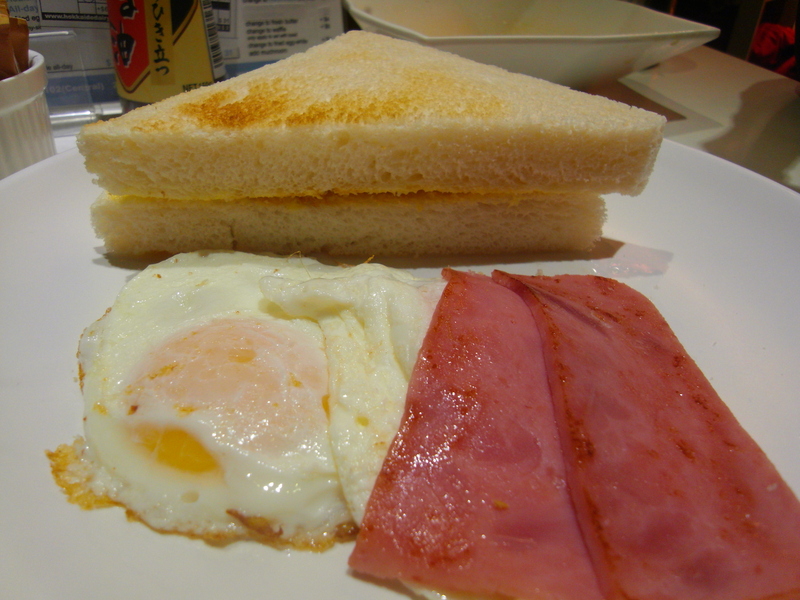 There’s also the rather impressive looking 3 inch fried egg sandwich with your choice of meat filling- luncheon meat, corned beef or sausage. Delicious at anytime of the day! This quiet, little establishment in Wan Chai has cool, retro black and white tiling, Cantopop albums hanging on the wall and a huge spread of the singers’ signatures displayed proudly for all to see, (the owner, I read, is a former manager at Capital Records). I really like this place for its no nonsense menu, very clearly laying out all that we love and adore in cha chaan tengs- thick, buttery toast, scrambled or fried eggs with ham and macaroni soup. The sets are simple and cheap as chips at $25 for a breakfast set of macaroni and ham, fried eggs, toast and coffee or tea. 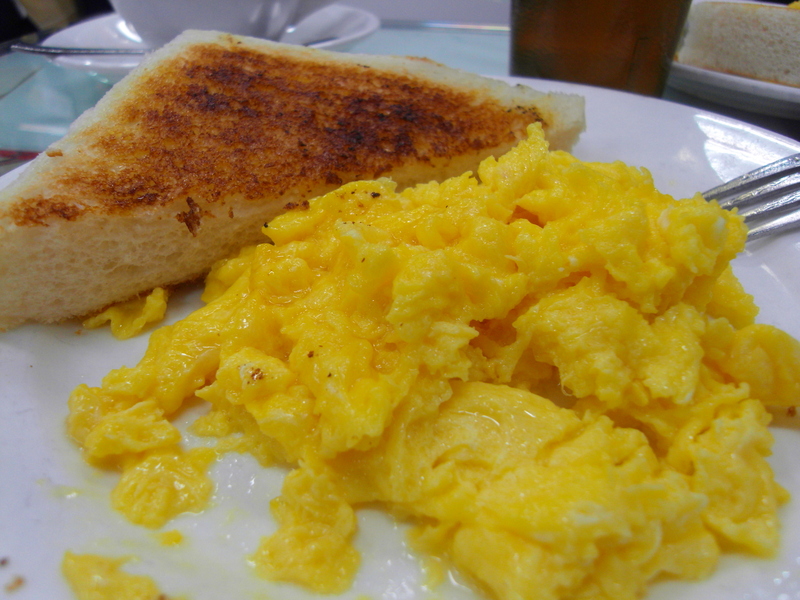 The scrambled eggs are smooth and creamy, the toast fat and glistening with buttery goodness and the milk tea sweet and strong to start the day. Categories: Cha chaan teng | Tags: Cafe Matchbox, Capital Cafe, cha chaan teng, Hokkaido Dairy Farm Milk Restaurant, Hong Kong, Tsui Wah | Permalink. Facebook is pretty useful. It helps you to track and “poke” unsuspecting friends, post your musings of the day, upload photos of your drunken nights so you can piece together the shenanigans of the evening and more importantly, helps you track down your next meal! My friend Krispy K (an eager BB photographer who uploads her photos onto FB faster than you can say “cheese!”) very helpfully uploaded photos of her midnight feasting at an extremely quaint and cool looking cha chaa teng in Causeway Bay called Cafe Matchbox. 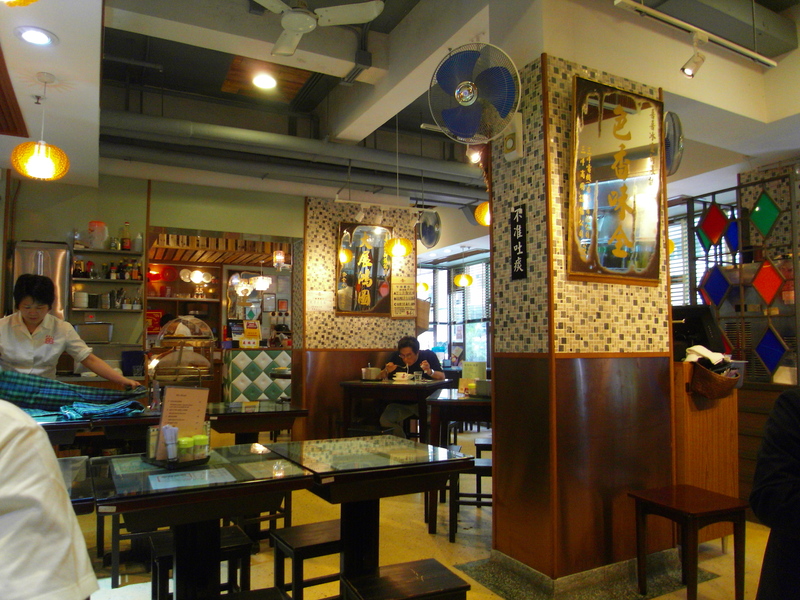 Continuing the “retro” theme, Cafe Matchbox has decked out its interiors in a Hong Kong ’60s style, with funky green and white tiling on the walls, tacky plastic lights, green blinds and the strains of Canto music of years gone by, playing in the background. I LOVE it. Nothing makes me happier than going somewhere cheap and cheerful and Matchbox hits the spot. The menu is jam packed with local comfort food, from your baked rice dishes to your soup noodles/ macaroni combo with good ol’ spam or ham with a fried egg. They also churn out some cracking traditional desserts such as egg tarts, mango pudding and cream cakes. But..when I went, my eye was on the prize. There was one particular set meal I was desperate to get my chops on and that was the chicken pie in green pea soup followed by banana hotcakes. Sounds awesome doesn’t it? Tastes even AWESOMER (not a real word, made it up, but I like it). The other set offers scrambled egg and ham with a thick piece of buttered toast to start, followed by BBQ pork and peas in a noodle soup. Not as exciting but definitely just as comforting. So….we got both sets! 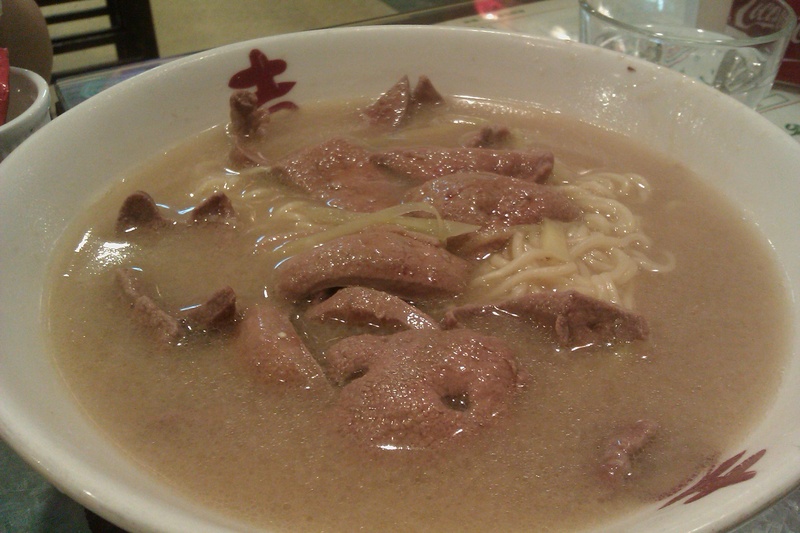 And, we also added a bowl of pork liver and instant noodle soup plus a beef consumme for SJ and 2 hot ovaltines for R and myself. Faint with hunger, us 3 girls waited in anticipation, practically drooling over the menu and gazing with food envy at our neighbouring tables’ food. SJ was like a girl possessed when her pork liver instant noodle soup arrived. Chopsticks dove into the big bowl and she eagerly dumped the noodles into her own little receptacle, and soon she was in raptures over the liver and the gingery soup. When R and I eventually got to the bowl of noodles, SJ was in a dream-like state and in a happy place (ok, I exaggerate, SJ is a very lovely, elegant girl but she was pretty darn hungry, never seen her attack food like that before- you go girl!) If you are a fan of offal like us, you will love the liver which was cooked to perfection. Some places over cook the liver until it reaches that rather tough and rubbery stage but Matchbox delivered very tender slices and the soup base was YUM. Then it was my turn to get all excited. 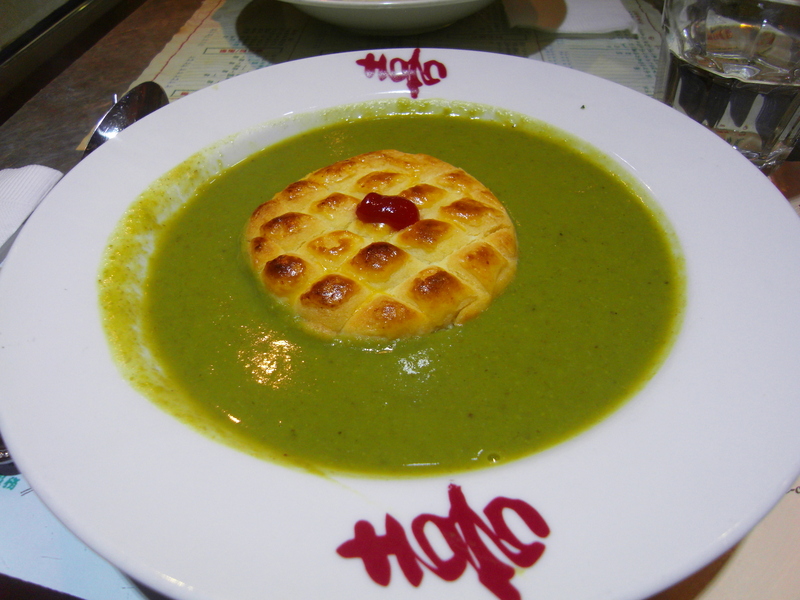 The green pea soup is an arresting sight- VERY green. It’s steaming hot and extremely tasty. The chicken pie pastry is exactly like the pastry used to make the egg tarts- sweet, light and just the right kind of flaky and the sweetness makes an interesting but moreish contrast against the savoriness of the soup.Words can’t express how happy us girls were when we bulldozed our way through this dish. 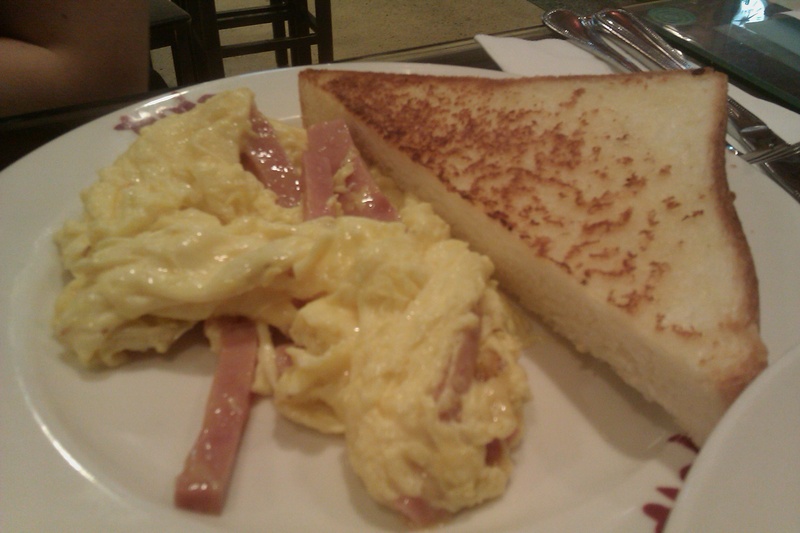 The scrambled egg and ham? All I can say is, I wish I could make scrambled eggs taste like that. How do cha chaan tengs do it?! And the thick cut toast slathered in butter was deeply satisfying. The BBQ pork soup noodles were decent, nothing amazing compared to the chicken pie but the BBQ pork was well prepared; the soup was just lacking a bit of flavour. The best part of the meal was definitely the banana hotcakes. 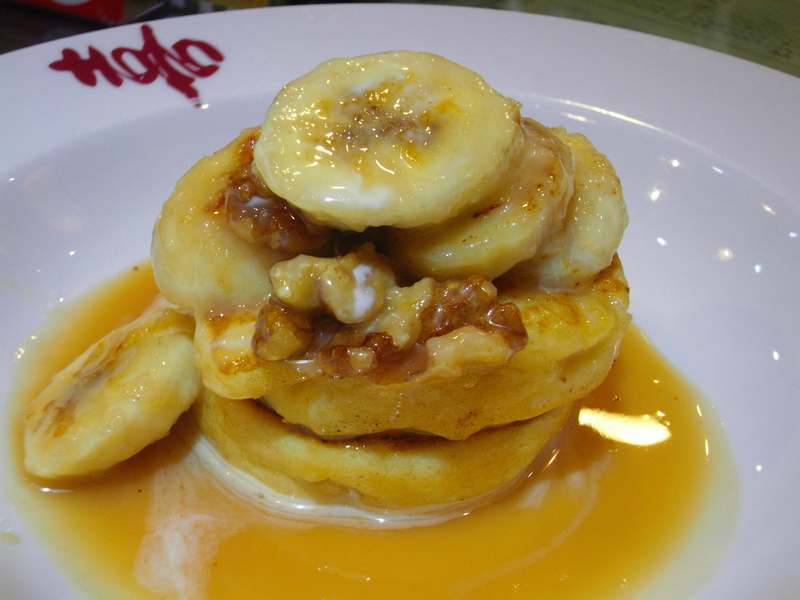 2 gorgeous soft and fluffy hotcakes drenched in syrup and a drizzle of cream, topped with slices of banana and walnuts. What more could you ask for to end a truly scrumptious, cheap as chips dining experience? Drool-worthy. 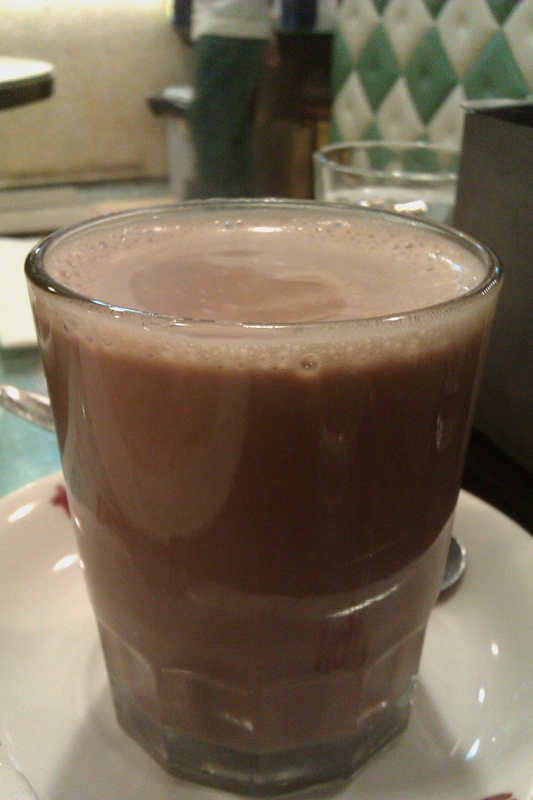 And, before I forget, the ovaltine was amazing too- just like your Grandma would’ve made for you. 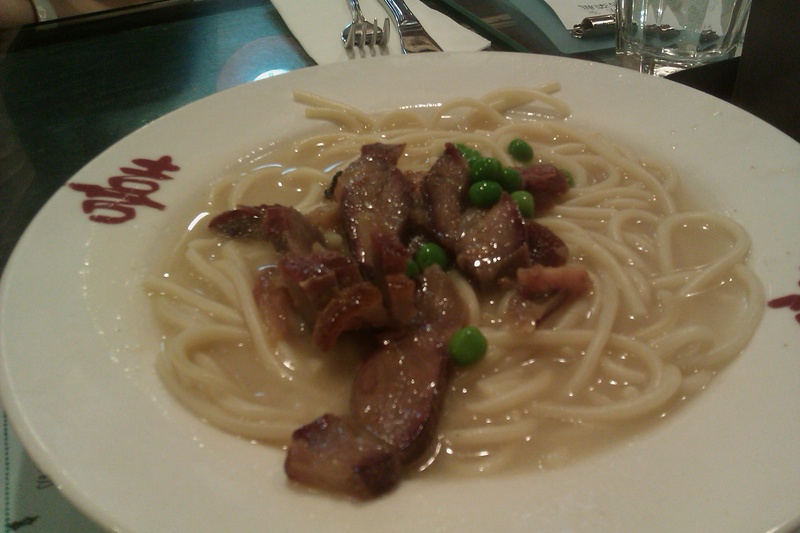 Categories: Cha chaan teng, Chinese, Hong Kong | Tags: banana hotcakes, Cafe Matchbox, Causeway Bay, cha chaan teng, Chicken pie, Cleveland Street Hong Kong, Hong Kong, Hotcakes, offal, Ovaltine, Pea Soup, pork liver noodle soup | Permalink.